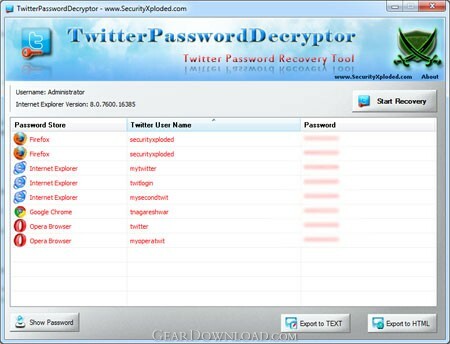 Twitter Password Decryptor is the FREE Software to instantly recover Twitter account passwords stored by popular web browsers. TwitterPasswordDecryptor currently supports recovering of Twitter password from following web browsers. # Instantly decrypt and recover stored encrypted Twitter account password from Popular Web browsers. # Comes with both GUI interface as well as Command-line version. # Automatically discovers the supported applications from their respective install location and recovers the password instantly. # Easier and faster to use with its enhanced user friendly interface. # Included Installer for assisting you in local Installation & Uninstallation. 'Twitter Password Decryptor' works on wide range of platforms starting from Windows XP to latest operating system Windows 8. Little confused how to download this app. Can somebody tell me?